n., From minomushi 「蓑虫（ミノムシ）」, the larval form of an insect called ōminoga, known as the bagworm moth. Throws a hard, pinecone-shaped object at the enemy. 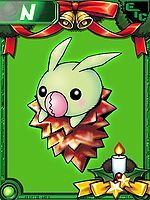 Minomon is the partner of Ichijouji Ken. 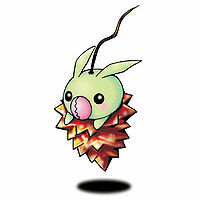 A Minomon is among the shadowed Digimon who wanted Makino Ruki to be its Tamer. Minomon serve as Snimon's spies at the Wind Factory. 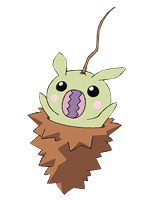 Minomon is no where to be found except being born from the Digitama, but can evolve to Wormmon if above level 10 and friendship 50%, Tentomon if above level 13 and defense 50, or Kunemon if above level 7. In Sunburst, he'll challenge you alongside with Kuramon and Imperialdramon Paladin Mode during the Platinum Rank battle at DigiColosseum. 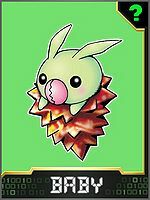 Minomon is available as a Digimon Medal. 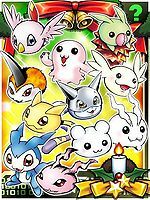 Minomon is an enemy Digimon.